My favorite part about my job is sharing ways you can do the beautiful and creative things you see on Pinterest that may seem out of reach, attainable. The best is when I can do that while figuring out how to save you time and money! Last week I shared the perfect brunch menu which I think would be great if you are hosting a baby shower/sprinkle! Expecting moms don’t need to spend a crazy amount of $$ on the shower OR saying thank you, so today I am sharing and easy way to create and send thank you cards! 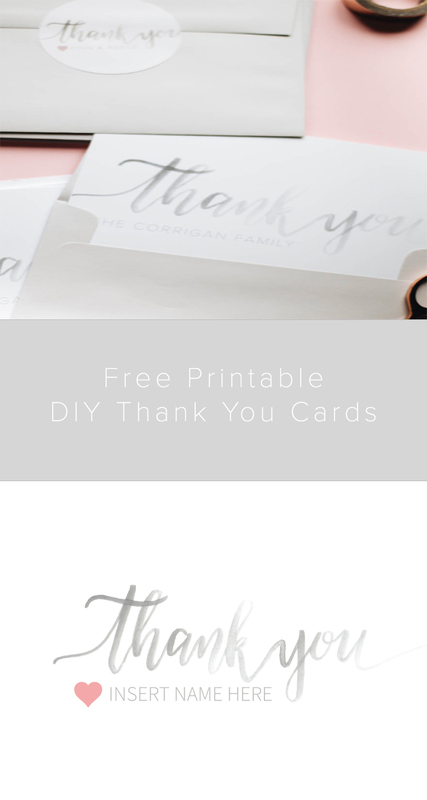 Below is the step by step guide for how you can create your own thank you cards with my free printables! 2. Fill in the names of who you want to send the thank you to. The thank you cards are formatted to print on 5×7. For the envelope stickers I used Avery’s 2 1/2 ” print-to-the-edge round labels for $16.99 for a pack of 90. I purchased the envelopes on Amazon. 100 for $9.99. For printing I recommend Catprint.com, Vistaprint.com or your local Staples. I emailed Staples the sticker file I created. They pulled the labels and printed for me, I just had to pay when I picked up (time savor with kids!). I hope you found this post helpful and would love to hear from you if you plan on using these! Please comment below and let me know what event you have coming up you might consider using my printables for! !